This is a sponsored post written by me on behalf of Cooked Perfect® Fire Grilled Chicken for IZEA Worldwide. All opinions are 100% mine. Rich and creamy Rosemary Thyme Au Gratin Potatoes make the perfect side dish for Cooked Perfect Fire Grilled Lemon Herb Chicken! 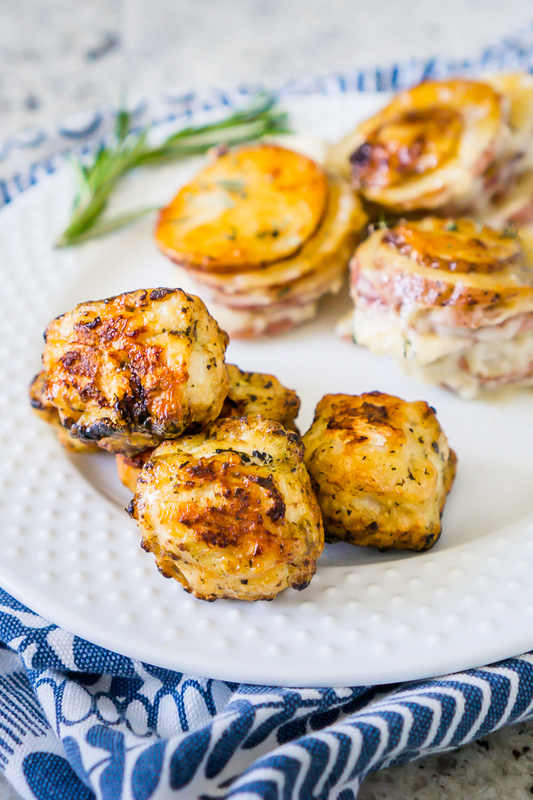 Whether as family dinner or easy lunch with potato leftovers, you will love this combination. 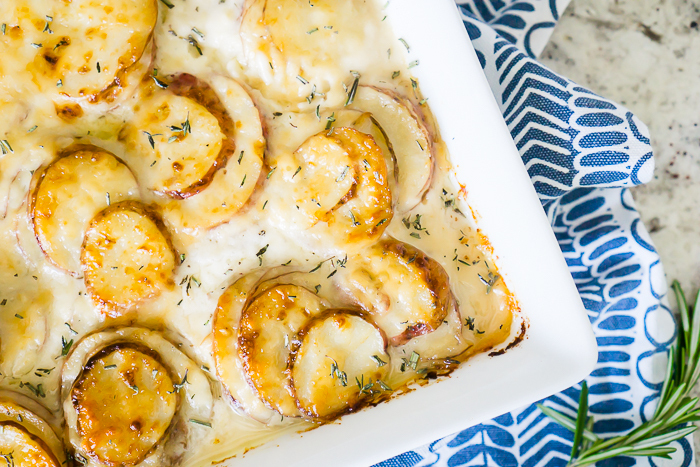 Creamy Au Gratin Potatoes with Fresh Herbs and Rich Gruyere Cheese is the Perfect Pair to Lemon Herb Chicken! 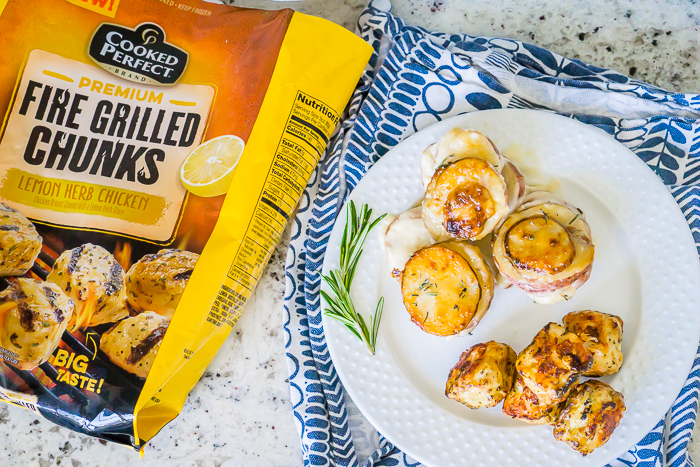 We’ve always had really good experiences with Cooked Perfect Fire Grilled Chicken in the freezer section and like to keep a bag or two on hand for quick main meal options. Liam is always down for chicken! But I decided I was craving something a little more substantial for a side dish to go with our Fire Grilled Lemon Herb Chunks last week besides just a salad, especially since we finally had some cooler weather to have the oven on. I’ve shared my easy cheddar au gratin potatoes before, but I thought it was time to share my Rosemary Thyme Au Gratin Potatoes made with gruyere and parmesan cheese! The cheddar au gratin potatoes are made with pantry staples I always have on hand and feel like the ultimate comfort food; these white au gratin potatoes have a richer cheese base and fresh herbs that provide a delicious side dish with more depth that you could easily make for Thanksgiving dinner! Both tasty and worth making, but this Rosemary Thyme Au Gratin Potatoes was definitely the right choice to be paired with the citrus herbal flavor of the Cooked Perfect Fire Grilled Lemon Herb Chicken. Cooked Perfect Fire Grilled Chicken is a convenient main dish for those busy nights we all have, especially with school back in session and the holidays just around the corner. All you have to do is open the bag, place your needed amount on plate or pan, and cook in either the microwave or oven. Cooked Perfect did all the pre-work for us by grilling the chicken over an open fire to lock in all the juices, meaning nice and tender chicken for us! Cooked Perfect comes in a variety of cuts, including chunks (Liam’s favorite), wings (Bryan’s favorite), tenders (my favorite), drumsticks and boneless thighs. Then you have lots of flavors to choose from like Bourbon BBQ, Buffalo Ranch, Lemon Herb, Classic Style, Wildflower Honey BBQ, Korean BBQ, and Zesty Herbs and Spice. There is something for everyone, so Browse Recipes & Save $1.50 and then Find a Store now! The Lemon Herb flavor has definitely become one of my favorites. 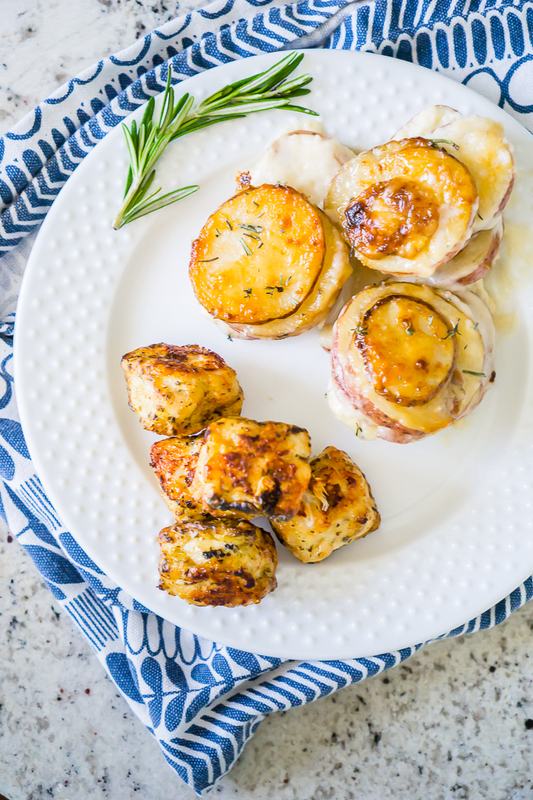 They are glazed with a light sauce made with lemon, oregano, and basil which makes them light and fresh! Now, I will say, these potatoes are not one of my super quick dishes. With the help of a mandolin though, the prep work doesn’t take long but it does require oven time. In order for the potatoes to get nice and soft, the potatoes cook for over an hour. Here’s why I love them though: 1, they can be prepped ahead of time and cooked later which makes them convenient if pressed for time on the night you want them; 2, they also make delicious leftovers so the one time work for this au gratin potato recipe makes at least 3 dinner-worth of sides for us; and, 3, they cook at the same temperature as the Cooked Perfect Fire Grilled Chicken which means I can add the chicken into the oven while the cheese browns on the potatoes. Liam and I have been eating the leftovers of the au gratin potatoes with more of the Lemon Herb Chunks for lunch. 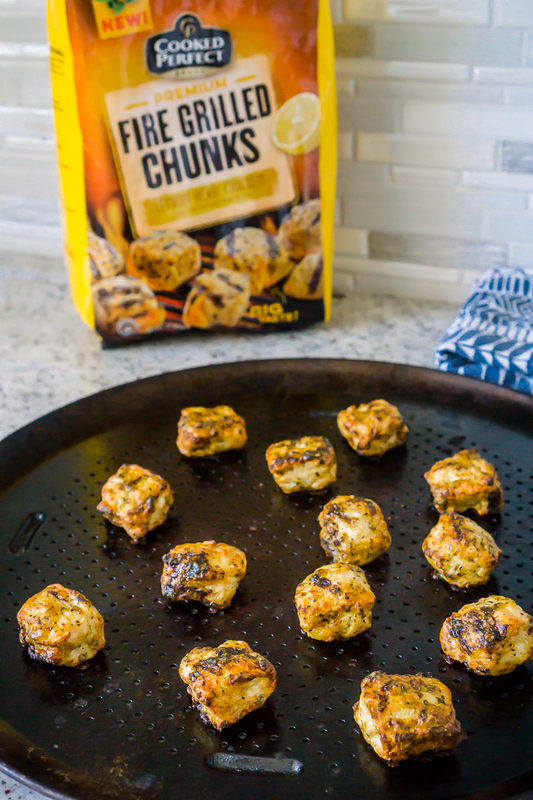 We’ve been heating them up in the microwave together and enjoying every single bite! Now, Let’s Get to the Recipe for Rosemary Thyme Au Gratin Potatoes with Gruyere and Parmesan! 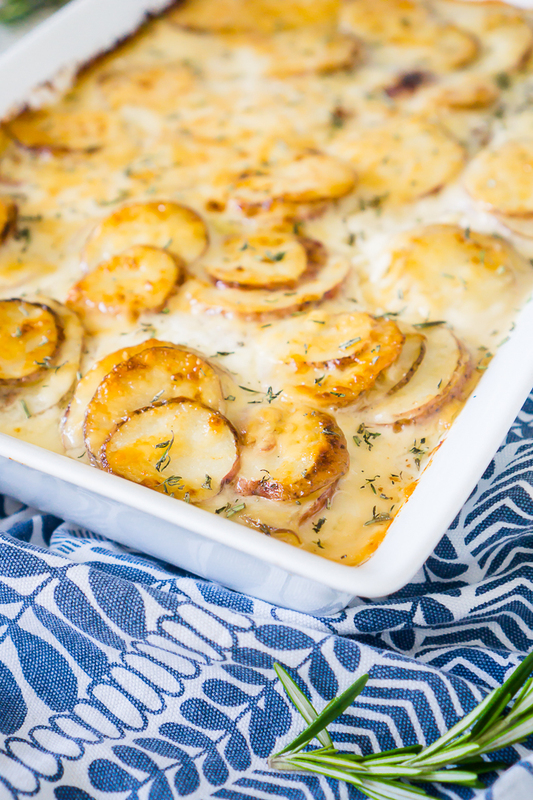 Rich and creamy au gratin potatoes with Gruyere, Parmesan, and fresh herbs! The perfect side dish for a week of family meals as they make amazing leftovers and tasty enough for a holiday side dish! Use a mandolin to slice your potatoes into thin slices - around 1/8" thick. You can cut with a knife but prep time will increase. You can place your potato slices into a bowl of water to avoid browning if needed. Prep your baking dish with cooking spray and layer your potatoes in little stacks (either vertical or horizontal depending on your preference). Melt butter in sauce pan. Add flour once melted and whisk together for 1-2 minutes. Slowly add in milk and seasonings, continuing to whisk over medium heat until the milk has thickened slightly. Remove from heat and add your cheese. ***If you are like me, you will be tempted to add more cheese. I don't advise it as it can lead to a different consistency and an "oily" result. Spoon cheese sauce over potatoes. Spray foil with cooking spray (to avoid cheese and potatoes sticking on foil) and then over dish. Bake for 60 minutes. Remove foil and bake for an additional 20 minutes or until lightly browned and potatoes are tender to the fork. Enjoy! You can either microwave potatoes until hot or re-warm your potatoes in the oven at 350 F for 15 minutes or until hot and sauce is slightly bubbly. These Millennials Bought a House!